A building access solution was created to overcome a myriad of challenges, calling for a remarkably large Series 6 crane-type BMU. Philadelphia’s Cira Center was conceived as an iconic structure which would appear to change form and shape when viewed from different vantage points and stand out from the prevalent ‘big box’ buildings in the city. This mission led to a pioneering design by world renowned architect Cesar Pelli who is well known as the creator of such landmark buildings as Petronas Towers in Kuala Lumpur. In contrast to the uniformly rectangular buildings which dominated the Philadelphia skyline, Pelli’s design for the Circa Centre called for a remarkably complex and elegant form which would shake up conservative thinking around what a traditional office skyscraper should look like. This kind of bold architectural statement was also a key benefit in terms of encouraging tenants and their workers to take up residency at a new site in a previously overlooked area of the city, away from what had traditionally been considered the recognised business district. 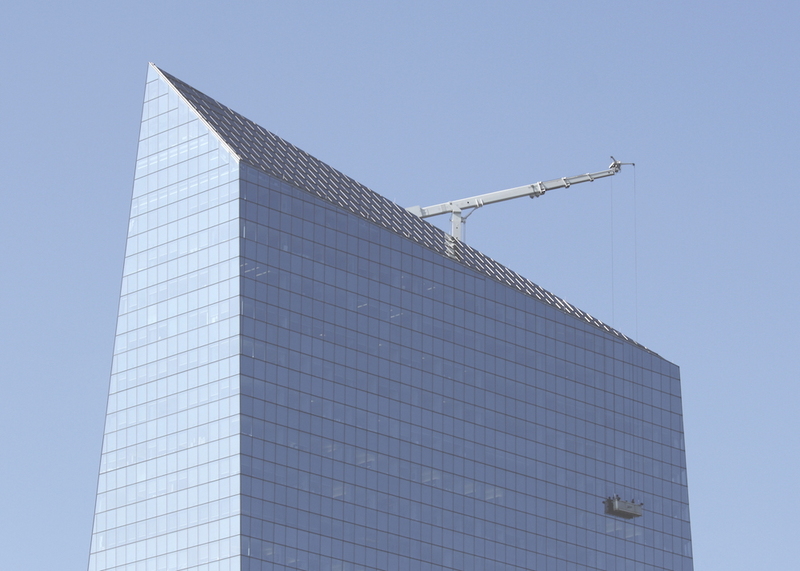 The truly unique form of the Cira Center begins with a four-sided structure at the base but, rising up beyond that, the design does not feature any right angles between the base and the six-sided roof. A key part of the concept was that, as well as achieving an elegant, arresting form as a whole, the building would also seem to change and transform depending on where it is viewed from. For instance, the east face projects out dramatically while the southeast face cuts back in towards the central spine of the tower. This breathtaking design has been compared to an irregular, cut diamond shape and means the floor plan varies from one level to the next. The facade itself is also a key part of the overall architectural vision, with a huge curtain wall clad almost entirely in semi reflective glass. The opacity and colour of this material responds to light and weather conditions, again adding to the beguiling impression of an ever-changing, almost living building. 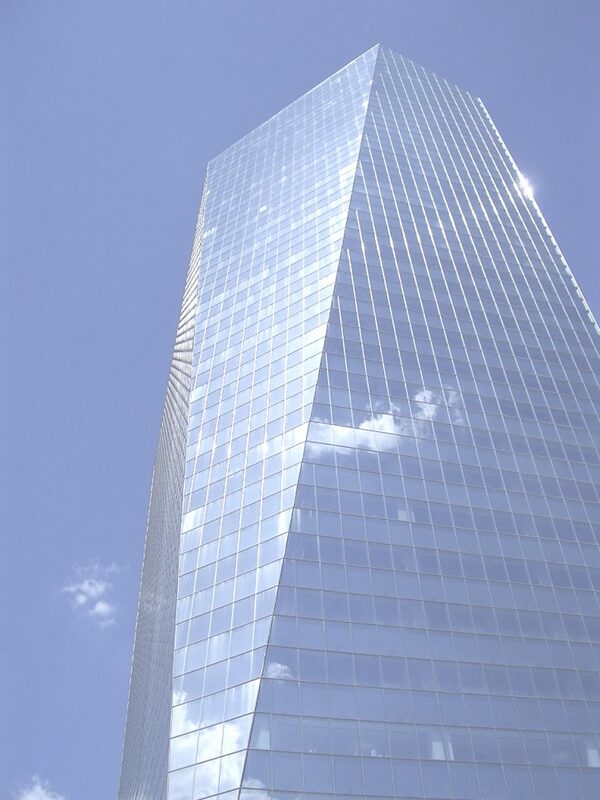 This unique and highly complex building required the equally innovative and pioneering skills of BMU specialists to ensure that the architectural vision was not compromised while also providing effective access to all parts of the building, including the key feature of the curtain wall which allows light to play across its surface. The diamond shaped, six-sided roof does not offer sufficient flat or level surfaces for a standard building access system and the elegant lines of the complex form also had to remain unspoiled. Manntech provided a building access solution to overcome all of these myriad challenges. The requirements of the building called for a remarkably large Series 6 crane-type BMU weighing 49.7 tons. The sheer size of the Building Maintenance Unit meant working creatively during the manufacturing stage of the project, as it was too tall to fit even within the Manntech 14 metre high workshop and instead had to be assembled outside with the use of mobile cranes. To preserve the architectural integrity of the building, the BMU features a telescoping mast which allows it to rise up from under the roof and launch from behind specially designed sliding doors, meaning it is entirely hidden from view when not in use. The BMU itself is capable of travelling on straight tracks and provides impressive outreach and manoeuvrability with a triple telescoping jib and jib luffing with a self-levelling head. Additional manoeuvrability for the cradle is provided by a complex system of mullion guides which allow the cradle to travel horizontally and navigate every part of the unusual structure. 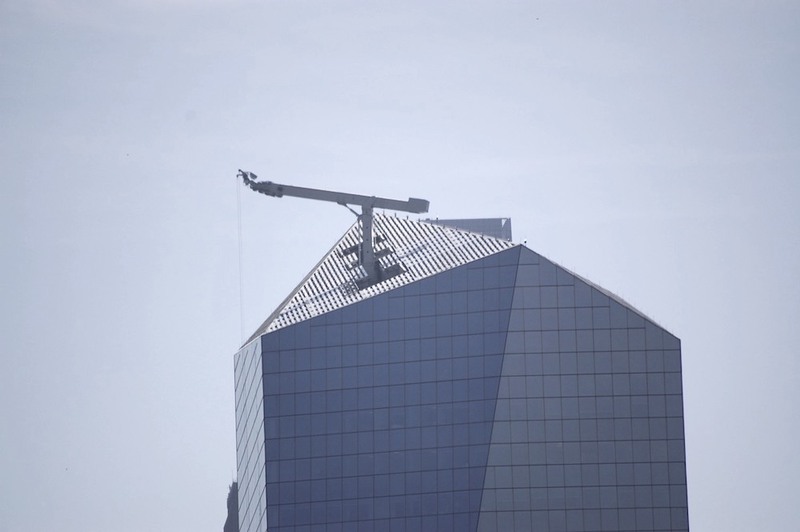 The final part of the solution was a materials hoist capable of lifting up to 1200 kilograms. Contact the BMU specialists to find out more about Manntech’s portfolio of innovative, German engineered building access solutions and how we can help with your projects.